The water year for 2016 came to an end on September 30, 2016. Each successive year of historic drought conditions has brought new water management challenges, and the challenge of managing limited reservoir water supplies for multiple uses has never been more difficult. Even though parts of Northern California experienced average to slightly above average precipitation during the year, spring runoff was significantly below average due to factors such as replenishment of depleted soil moisture, increased uptake by vegetation, and less precipitation falling as snow. The April 1 statewide snow water equivalent was 85 percent of average in 2016, but still not enough to achieve average runoff levels. At the October 27th meeting of the Delta Stewardship Council, John Leahigh, State Water Project operations chief for the Department of Water Resources, briefed the council members on the drought impacts to the operation of the State Water Project, how the State Water Project met challenges due to the fifth straight year of drought, what the outlook is for the upcoming water year, and what the State Water Project prepared in their drought contingency planning. 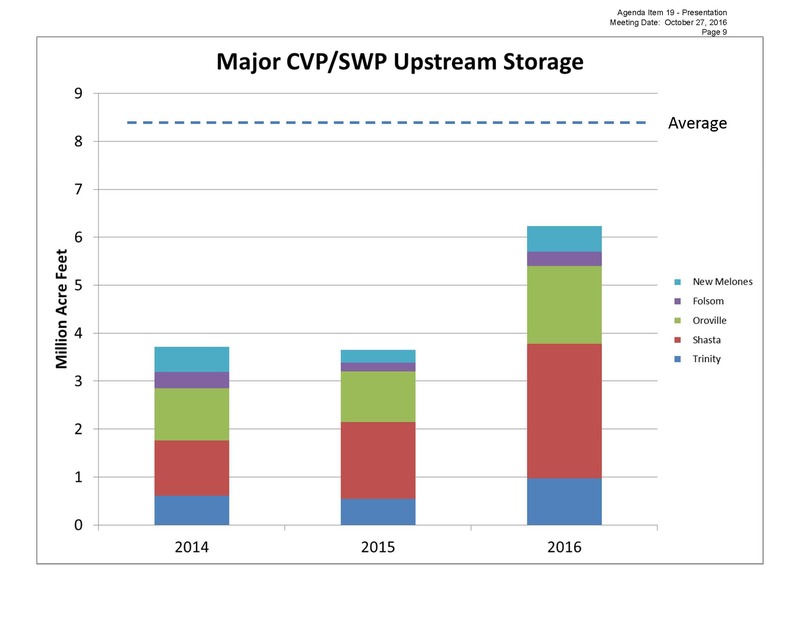 He then presented the same chart for the San Joaquin basin, noting that they had about average precipitation, but the two prior years had about half the average. 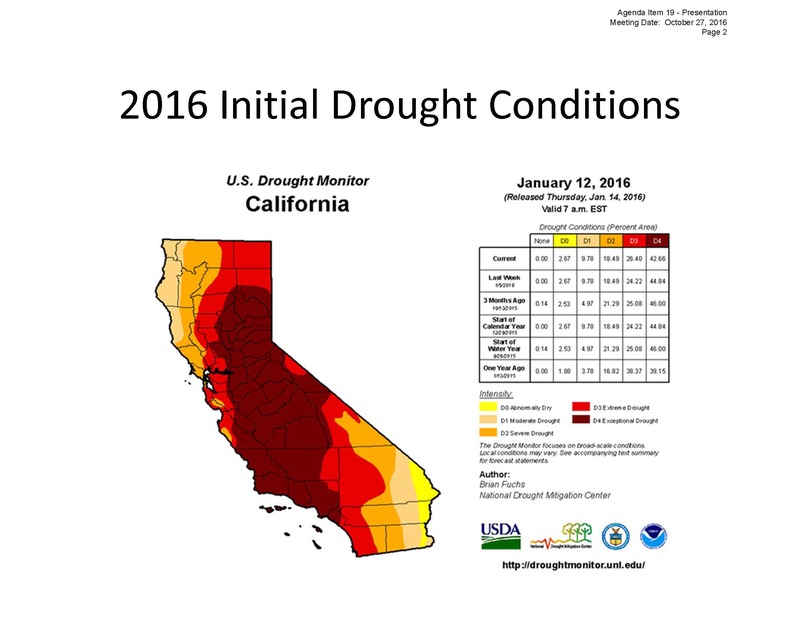 “All the indicators are, even though the Sacramento has been dry, the San Joaquin has been that much drier,” he said. 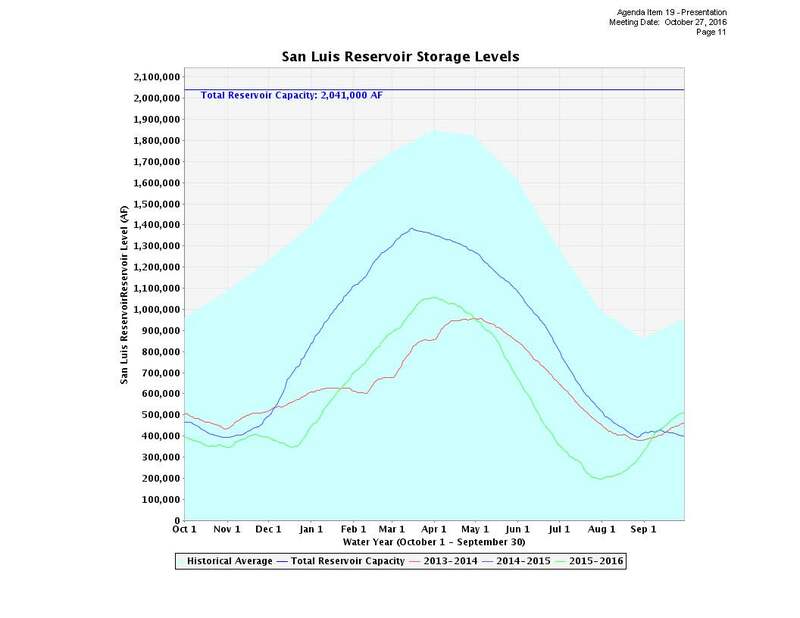 Mr. Leahigh noted that the Central Valley Project allocated every drop in their share of San Luis, with the State Water Project covering the dead pool storage. 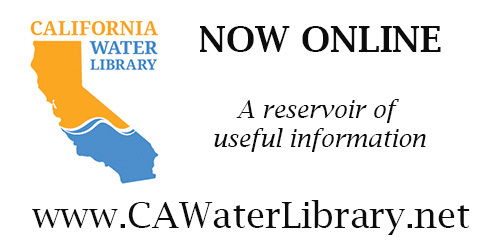 Mr. Leahigh noted that the previous two water year classifications for both the Sacramento Valley and the San Joaquin Valley have been critically dry. 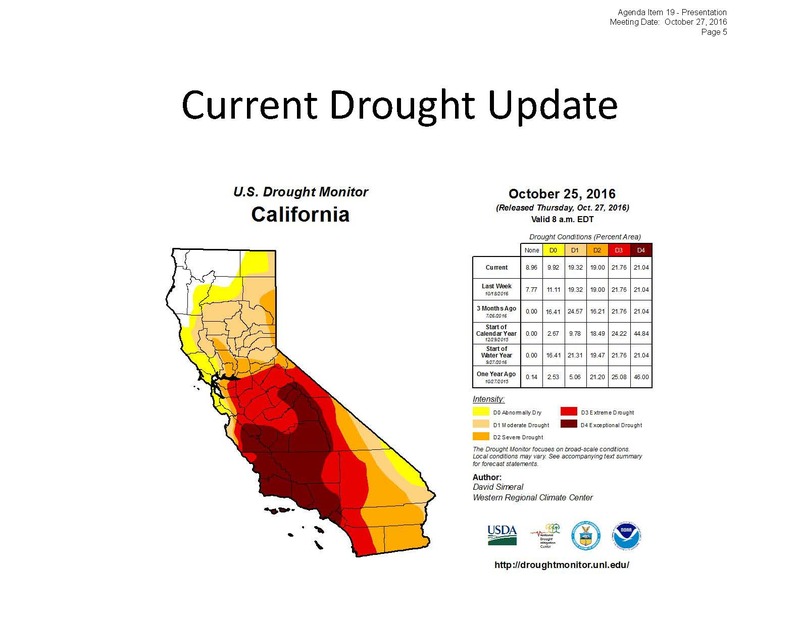 This last year, the Sacramento Valley improved to below normal, extending the streak to nine out of the last ten years having below normal or drier year types for the Sacramento Valley, he said. 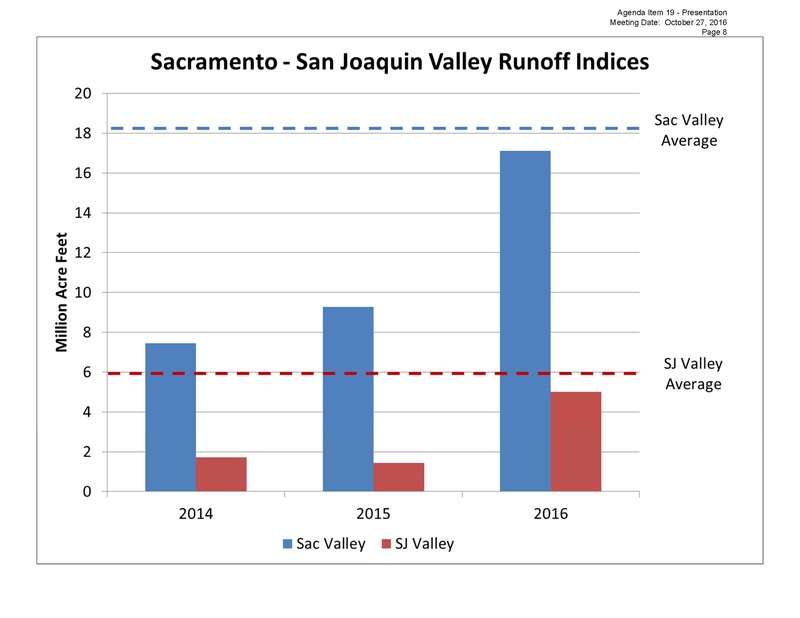 The San Joaquin did not improve as much; it was dry year classification for this year. The snowpack did improve from the dismally low 25% and 5% the last two years; it was 85% so it was still subpar, but it certainly was a big improvement from what we’ve seen. 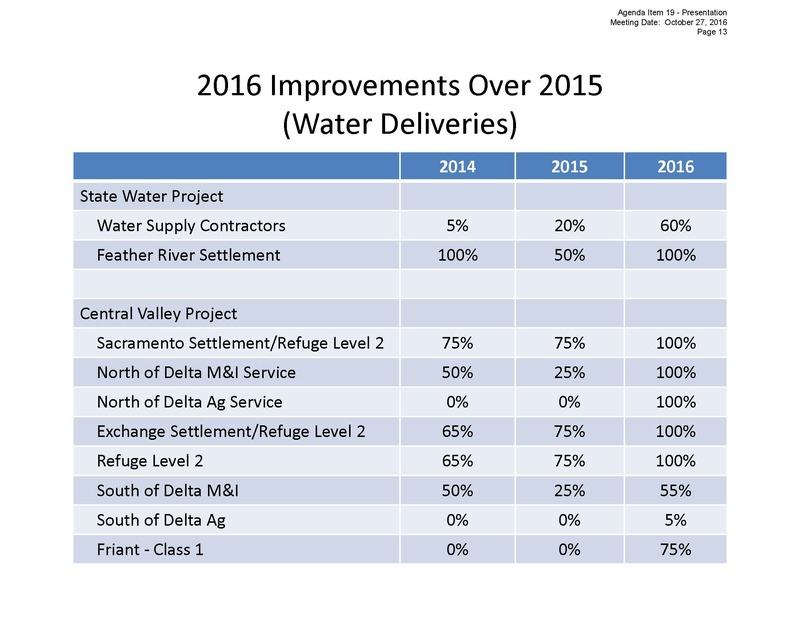 Water deliveries were improved this year over previous years, which have been very low in previous years. “60% is a decent amount for the State Water Project, but still not fully meeting a level that would really help us completely dig out of the dismally low deliveries that we’ve seen the last couple years,” he said. The State Water Board lifted the 25% mandatory cut on water use last year, as well as some of the curtailments of some post 1914 water rights, he said. There was no need for a salinity barrier as in the previous years. 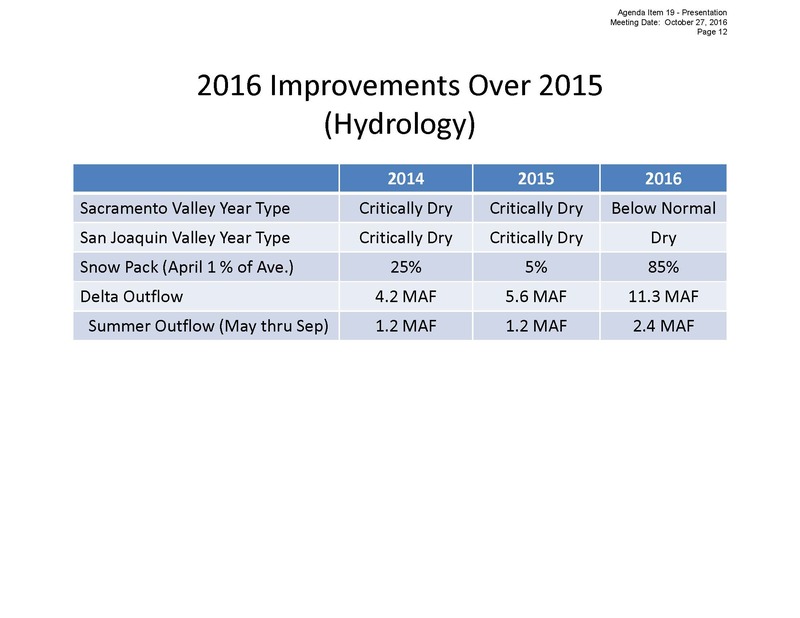 Temperatures in the Sacramento River were improved this year, relative to the last couple of years. The current outlook for the next three months from NOAA are for warmer conditions for California and much of the country; the expectations for 2017 for precipitation is a La Nina condition, which typically means drier conditions in the south; the outlook is for equal chances, he said. The Delta is defined by its levees – about 1100 miles of them, surrounding 146 islands and tracts, protecting the lands, lives, and infrastructure that live behind them. However, maintaining and improving Delta levees is expensive: recent estimates peg the cost of bringing the Delta levees up to state and federal design standards at $1.3 to $3 billion, and that’s just a fraction of the $50 billion needed overall statewide for flood control infrastructure. Funding for Delta levee improvements has primarily come from the Department of Water Resources ­­with a portion of those expenditures being matched by funds from local reclamation districts. 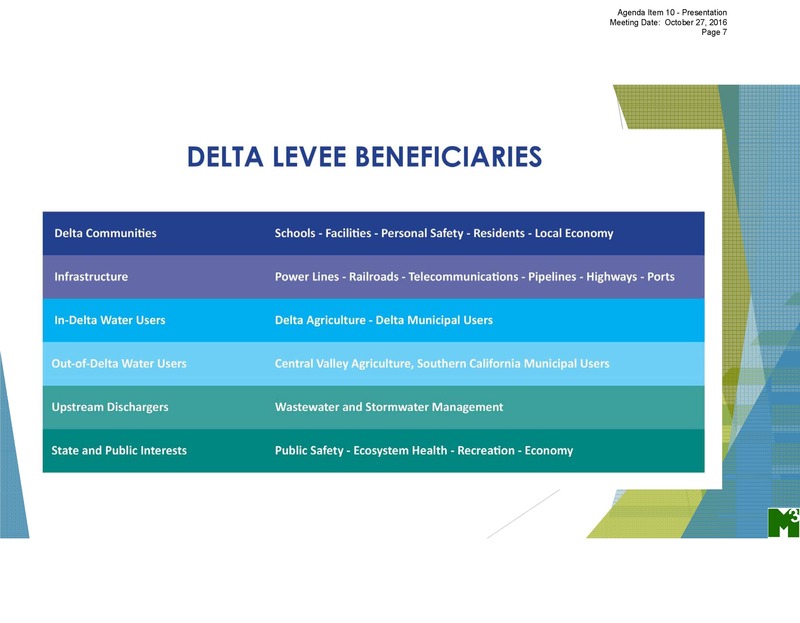 But these funding sources don’t capture funding from the multitudes of other beneficiaries of the protection Delta levees provide, mainly those who have energy, transportation, water and wastewater supply infrastructure, as well as waterfowl hunters and other recreational users. 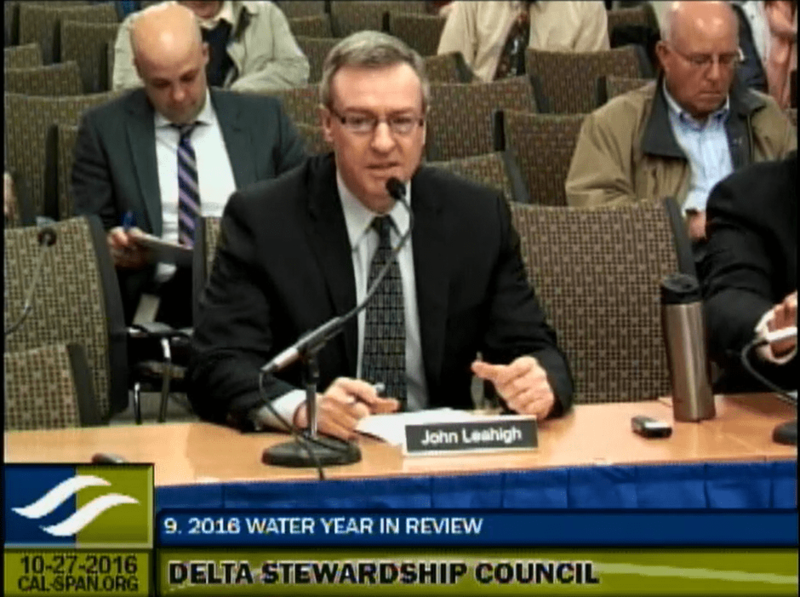 Recognizing this, both the Delta Protection Commission’s Economic Sustainability Plan and the Delta Stewardship Council’s Delta Plan have recommended studying the feasibility of creating a regional district to assess levee beneficiaries for maintenance and improvement funds. To evaluate the possible mechanisms and methods for assessing fees to other beneficiaries of Delta levees, the Delta Protection Commission is in the final stages of completing the Delta Flood Risk Management Assessment District Feasibility Study with a final report due in December. 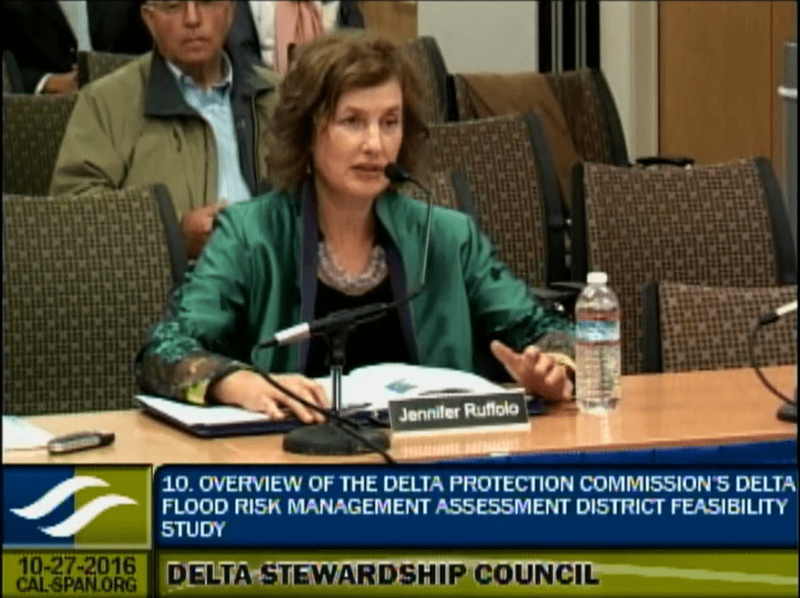 At the October meeting of the Delta Stewardship Council, Jennifer Ruffolo, Program Manager with the Delta Protection Commission, briefed the council members on the preliminary findings and recommendations. Ms. Ruffolo began by noting that the study raised as many questions as well as answers, but they did find some clarity in certain areas. 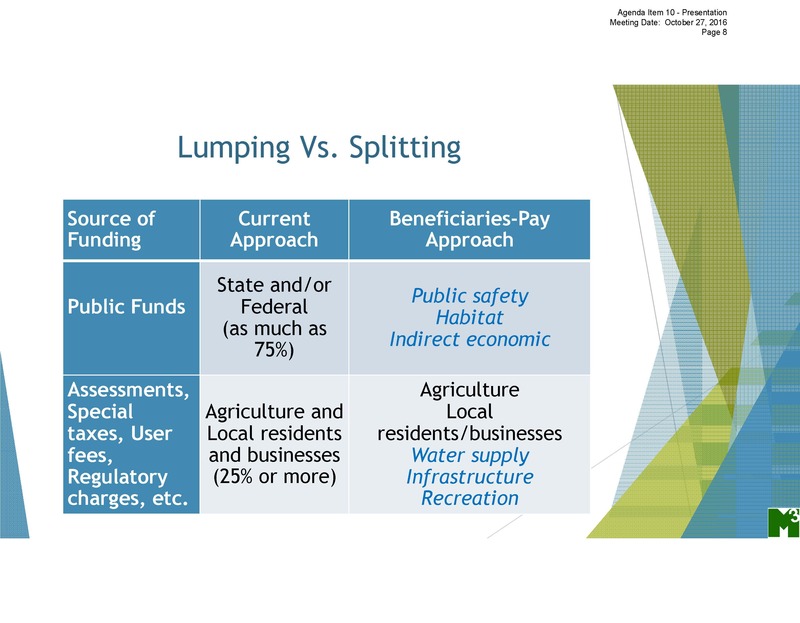 The study came about because bond funding, the major source of funding for Delta levee improvements, is running out, and furthermore, bond funding is not reliably consistent. She noted that the assessment district idea appears not only in the Council’s Delta Plan and the Commission’s Economic Sustainability Plan, but the Governor’s California Water Action Plan as well. 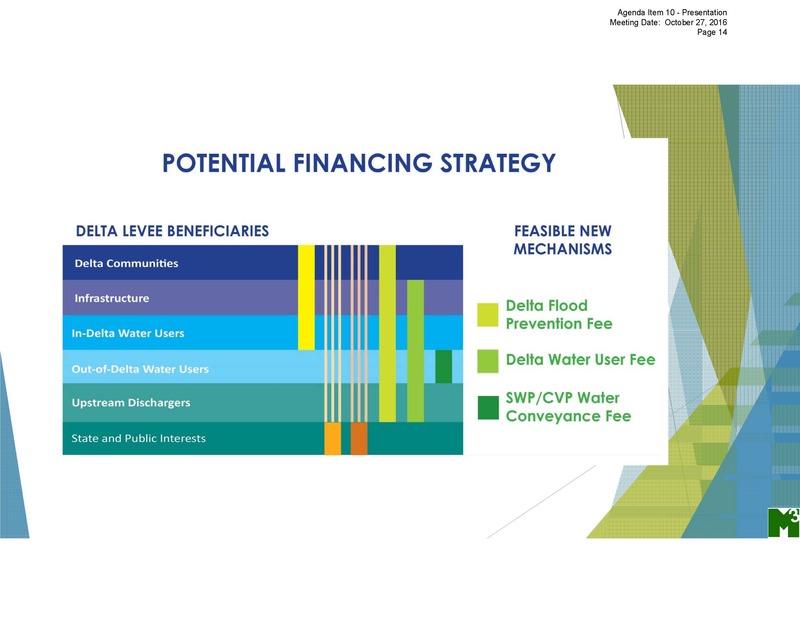 The objectives of the study were to identify the beneficiaries of Delta levees; evaluate potential financing mechanisms across beneficiaries; identify the most feasible mechanisms; and to recommend next steps to further explore a portfolio of mechanisms. The study was based on building blocks, which were technical memoranda that detailed levee funding and legal issues; beneficiaries and benefits; cost allocation principles and constraints; and financing mechanism screening. The memoranda were presented to stakeholders in a series of workshops to give them an opportunity to review the fundamental data and assumptions, and to ensure stakeholder buy-in throughout the process. She noted that there may be governance reasons that might propel the Council or the Commission or DWR to look further into an assessment district, but not to further the beneficiary pays approach. They evaluated about 50 candidate mechanisms, looking at the institutional, legal, cost responsibility, and political aspects of feasibility. They reduced that to about 12 and then with further screening, came down to essentially three, in addition to the existing mechanisms of bond funding and assessments. There are a lot of questions about how far the benefits extend and what would be reasonable to include in the realm of Delta beneficiaries; Ms. Ruffolo said that this was a very high level feasibility analysis that didn’t get into those detailed questions, but those questions would need to be answered if further study or implementing a beneficiary pays approach is to be considered. The current financing mechanisms are assessments, the general fund, and general obligation bonds. 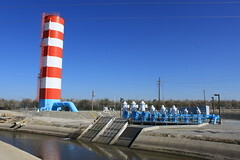 Assessments cover the shares of Delta communities, infrastructure, and in-Delta water users; state funding covers the public interests and probably a considerable proportion of the private benefits and interests, she said. 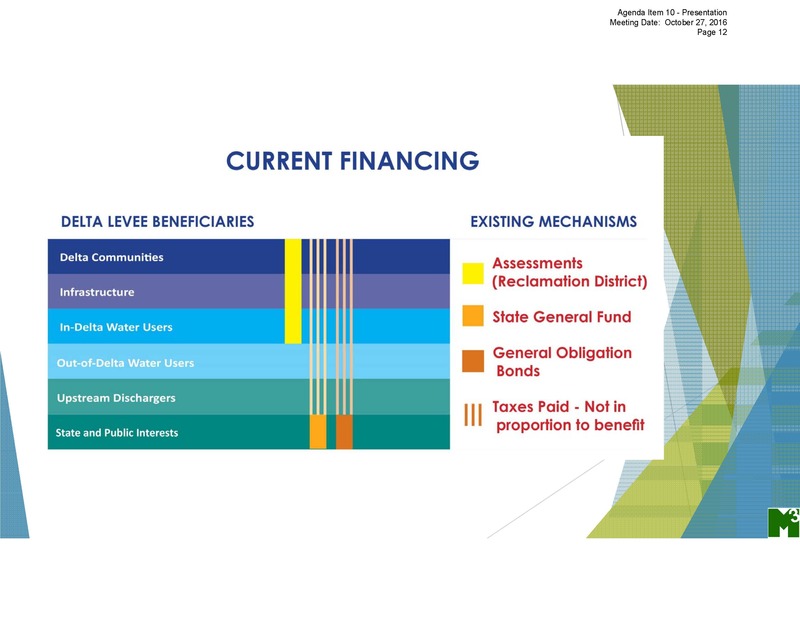 The striped lines on the slide indicate that to the degree that everybody pays some taxes, and the general fund pays for general obligation bonds and the levee money that we have now, people and other beneficiaries do pay, but not in proportion to the level of benefit that they receive, she said. “This study raised as many questions as it answers, and we clearly would need additional analysis of the different classes of beneficiaries, how far the benefits extend, and perhaps a collaborative effort between Stewardship Council, the Delta Protection Commission, DWR, and the flood board would be in order to figure out how to tackle this at the next level,” she said. Those questions include the legal restrictions and how would they be addressed; what agencies should implement the different fees; would new legislation be needed; would the increased revenue justify the transaction costs; would there be sufficient stakeholder support; and could the political will be mustered to move forward? Other issues worth deeper analysis would be to take a deeper look at the possibilities of a Delta-wide assessment district and to improve governance issues and consistency issues; it’s also worth taking a look at the federal funding available, but Ms. Ruffolo acknowledged that it’s not likely to be a significant source. The next steps are to prepare the final report, which will include the complete background and approach, the methodology, the mechanisms, the findings and the recommendations. That will be presented to the subcommittee at the Delta Protection Commission in early December, and then approved by the Commission at a subsequent meeting. Click here for agenda and meeting materials. Click here to watch on webcast. Restoring deep Delta River DREDGING purifies the soil and water (with 100 Year USACE/engineer maps) is cost effective. Health and financial losses to five Delta River counties has not been included, not to mention affiliated agri-tourism jobs. 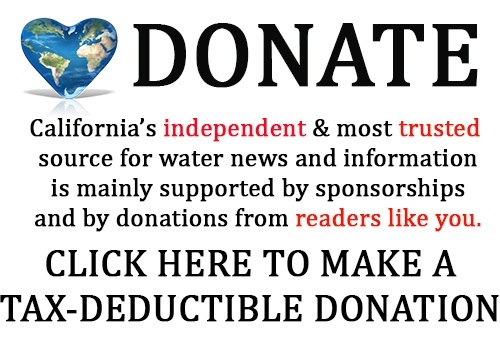 California Desalination produces twice as much water for 90% living on the coast. The destructive twin tunnels plan is a dust debacle, for health, finances and fertile soil in North Central Valley (with Delta River counties). The Dustbowl documentary shows others were in clueless denial by others of decades for the Midwest. Concrete costs can go to 28 points of Desalination, not ignoring the Groundwater and Aquifer issues that avoid California earthquakes. 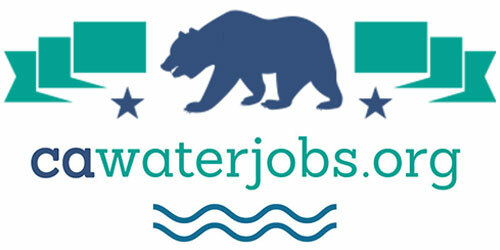 Who hires and pays the water bureaucracy?